We have an in house team of developers able to provide bespoke database applications, especially those that in interface with websites. Our clients for this work range from small business up to major multinational corporations and we have produced systems ranging from small website applications through to sophisticated management information systems. Our preferred development platform is LAMP (Linux server, Apache operating system, MySQL database and PHP programming language). This is a popular choice with government agencies and large business keen to avoid expensive license fees from the alternative Windows based development. We are ISO 9001 accredited and make use of online project management tools to keep track of project progress. We have produced database systems for interfacing between marketing websites and finance product calculators in markets such as loans, pensions and private healthcare. Many of these systems require secure servers as dealing with confidential medical or financial data. They often involve integration with 3rd party calculators or best deal finders. It is possible to show complex set of data graphically and if the data relates to geographical regions to show this with Google maps or Google earth. We work with Bureau Veritas and defra on many air quality projects to show data on maps on websites. Some of these datasets and very large and require data manipulation and analysis before display. We have produced integrated management information systems that deal with all communication between the company and their clients. We have done this in industries such as healthcare and adult education. 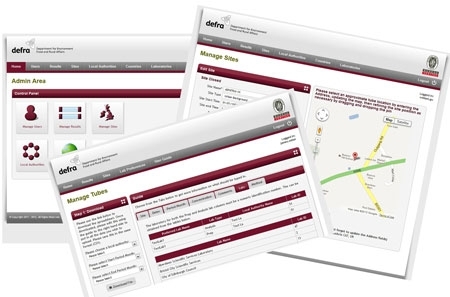 This starts with leads generated from the website or by phone or email, includes a record of all communication, generates customisable email responses and PDF attachments, allows for online payments, records all payments received and made (to suppliers) and provides a reporting system for managers. Activities can be scheduled and highlighted in terms of priority. Access and reporting levels available vary with access level. In one such system we have included a booking and room allocation system making it easy to assign to rooms according to language spoken and gender. A much simpler alternative to a full management information system is a marketing system; this tells quickly where good leads or sales have come from and the aim is to provide just the information needed. As processes get moved online there is a need for systems which accurately record the process of sending, receiving, auctioning and replying to documents. These projects range from the simple job applications systems to the more complex handling of local authority report submission over many years with multiple levels of review and different reviewers depending on geographical location. This is a VLE (Virtual Learning Environment) aimed at Primary Schools. It enables effective communication of homework between teachers and parents at a level appropriate to their age, and is very quick and easy to use. A key consideration here was a system which reduced workload for teachers and made their job easier. Responses from schools have been very positive in this regard.